I currently have three pairs of maternity jeans type pieces of clothing. 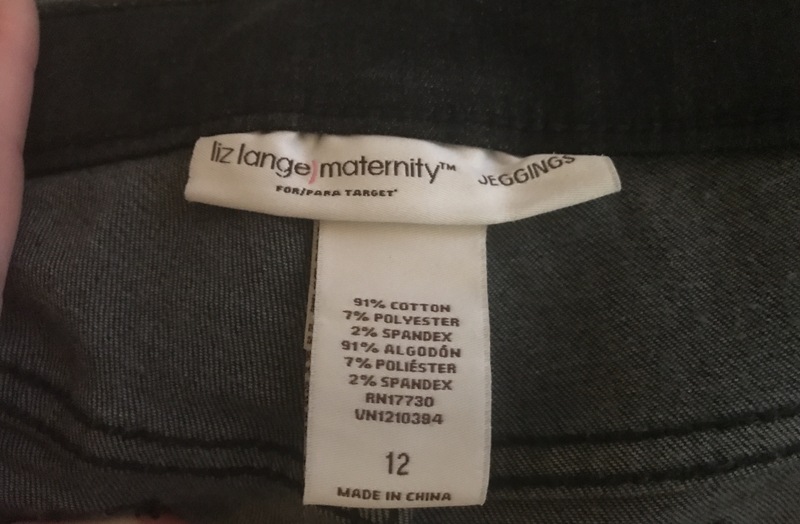 I first reviewed my Indigo Maternity blue jeans, and now it’s time to review my Liz Lange Maternity Jeggings. I had heard about the jeggings concept years before, yet had never purchased a pair prior to my pregnancy. 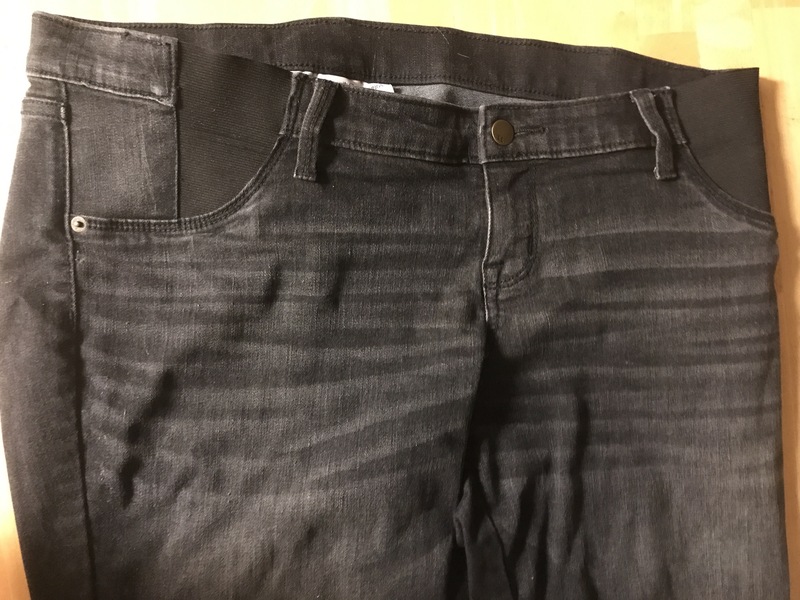 I had heard comments that jeggings don’t look exactly like real jeans and would be spotted easily for the hybrid product they are. I don’t think that is the case at all for these, in fact, most of the time I just think about these as regular jeans, which is definitely a plus for me. 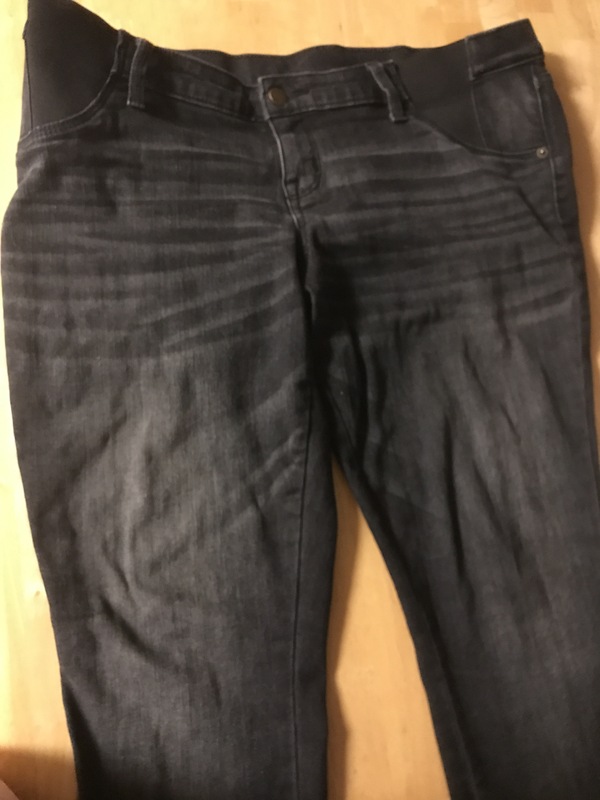 As a teen and young woman, I often enjoyed having the brand names of my more recognizable and expensive jeans having the outside labels clearly show the brand names. This has become much less important to me and so now having a pair of jeans that doesn’t advertise the manufacturers name is a plus for me. The only place you’ll find that information is on the inner tag of the jeggings. The jeggings have the belly band style instead of the over the bump pull up (as my blue jeans do). I go back and forth on which I prefer. This style puts less fabric on the baby bump, which can be nice, though if I bend or twist the wrong way, some belly skin is exposed. As some have said in their review the belly band isn’t a perfect fit. This is certainly true for me, though I’m not sure if the overall size chosen was the issue. 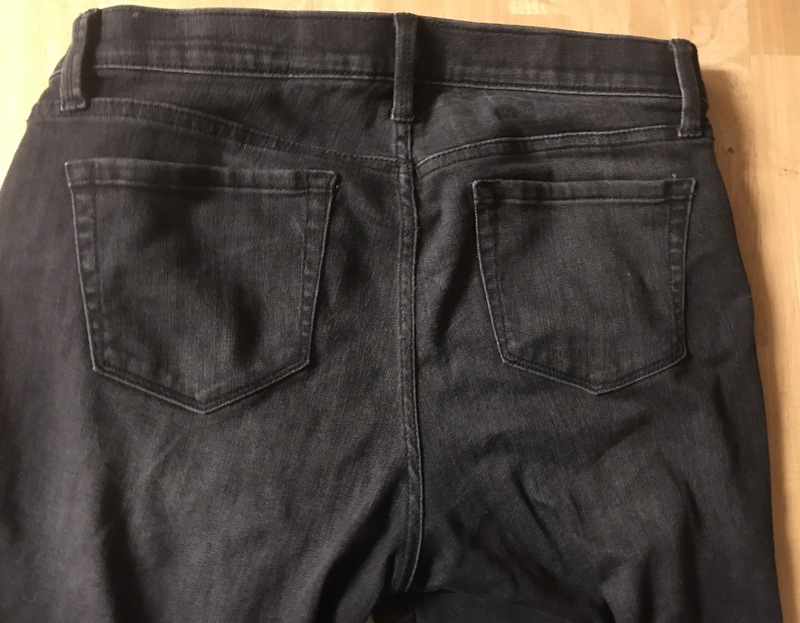 One thing I did not like about the jeggings is that they only have back pockets. I rarely carry a traditional purse, if I’m at work I’ll put things in my laptop bag and usually keep my pockets; when I have them front pockets, full with things including my keys and my phone. I miss front pockets on this and my blue jeans. At first I thought this was due to the belly band style, then I bought my very pale blusish white maternity jeans, a thrift store find I will review later on the blog, which also have the belly belt style and have front and back pockets. I didn’t take pictures of the jeggings prior to me adding them to my clothing rotation, yet I really wish I had. In the time since I’ve had them they’ve gotten lighter in color despite careful machine washing. I realize all cotton material fades, yet I was hoping they would stay close to the darker material that they were. My last concern with these is probably related to something that is a factor of how they were made for comfort. They wrinkle easy, as you can see above and the color fadings are especially noticeable in the wrinkles. I am used to this with my regular jeans, but this happens much more so here. I enjoy wearing them overall, yet there is a lot I wish were different about them. Therefore, I rate them three baby booties out of five.